Lighting a room is a science in itself – you have to get the direction of light and amount of illumination ‘just so’ to ensure there isn’t glare or any dark areas. What’s more, the choice of lamps, shades, bulbs and controllers is seemingly endless! 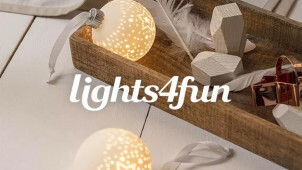 Searching for the perfect end result on a budget is just another obstacle on your interior design journey – but lighting offers from well-known home retailers and online specialists bring financial relief to your never ending decorating shopping list – and the result? A perfectly lit space, for less. From ceiling lights and desk lamps to standing designs and wall attachments, there’s plenty of choice online and on the high street to make sure you find the right lighting solution for every room in the home. When you’re updating, renovating or moving in to a blank canvas, you’ve got the choice to create the perfect space in a style that suits your lifestyle. For a deal on current interior trends, grab a home lighting discount and get creative! Choose simple shades for your ceiling lights, or go for bright colours to illuminate the room with beautiful hues. If you’re going for minimalist chic, Scandi lighting and large contemporary floor lamps are sure to fit perfectly in your modern setting. Online you can find a whole host of specialists stocking beautiful and innovative designs, not to mention the ranges on offer at your favourite department stores.